Set to a vibrant fusion of electronic and world beat music, this is a beautiful, feminine show unlike any other. Two women weave illuminated patterns of fire in a breathtaking performance of dance and fire artistry. The graceful movement and the hypnotic effect of skilfully manipulating fire create an original form of dance that keeps the audience mesmerized. The Fire Weavers show is a product of years of practice and training. A high level of technical skill and artistic presentation has made them a crowd favourite both on stage and on the streets. Add a high caliber fire dancing performance at your event. A solo fire dancer will add excitement and make your event memorable. The solo fire show is an unforgettable 15 minute performance. Hire a solo performance to wow your guests. If your budget permits, hire two or all three of us to offer a unique performance that involves close up partner fire dancing choreography done only by a few other fire performers in the world. The fire dancing duet or trio is an unforgettable 20 minute performance. How Fire Weavers came to offer a great fire show. From 1996 to 2006 these 3 women had begun their discovery, their exploration and their development of the art of fire dancing through exchanges with other artists and through training and self exploration of this art form that was new to their part of the world. 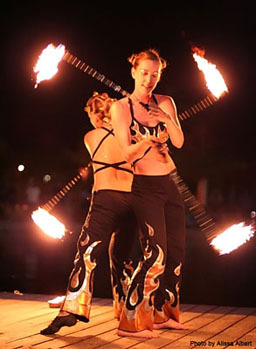 In 2002 and 2003, Sophie and Amber began to perform professionally with fire. In 2003, these two professional fire artists joined forces to create the Fire Weavers. 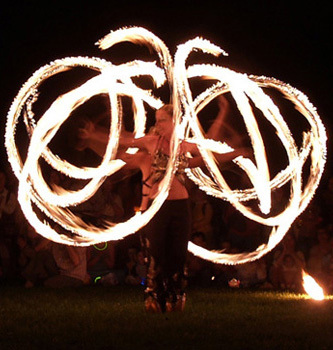 2004 saw the debut of the Fire Weavers show, made up of beautifully choreographed fire juggling, fire poi spinning, fire torches, and single and double fire staff spinning accompanied by a blend of world beat and electronic music. 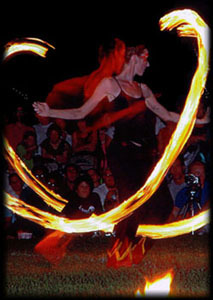 2005 saw the introduction of fire hoop solos with both single and dual fire hoops, as well as more intricate close-up partner dancing in both the poi and fire torches routines. The dance is performed inside a circle of flaming bowls, which adds an element of drama to the performance. From 2006 to 2008, the show was taken to an even higher level each year with more advanced technical skill and artistic presentation. As seasoned performers, they continuously add new elements and refine their choreography. In 2009, Amber spend 6 months in Buenos Aires learning and training in tango dancing. During that time, Brigitte joined Sophie for new and exiting duet show bringing her hoop expertise and some new elements to the show such as a fire fan duet. 2010 saw Amber returning to Canada and the three got together combine all the best choreography in the greatest show so far, the Fire Weavers trio. The shows now include sensual fire fan choreography, some breathtaking staff manipulation, intricate poi moves and daring fire hoop choreography. The duet and trio show is always full of close-up complex tricks and stunts, but the show is much more than just technical moves. Always keeping in mind the effect they have on the audience, the show has been put together and choreographed to both mesmerize and make people react and take notice. 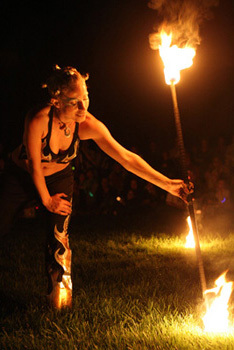 On special occasions, the Fire Weavers have performed with live percussionists and other fire artists. Due to the illuminated nature of the show, it is most impressive seen after dusk, although we can also perform indoors under certain conditions. Book a fire show for your event! All of our equipment is made to the highest possible safety standards and is routinely inspected for quality prior to each event. We take the utmost care in the management of our equipment and fuel while on site and prior to each show. We take special care prior to each show to spin out excess fuel from our equipment and to capture this excess fuel to be reused (rather than released onto the grass, trees, or floor of your event)! We provide all of our own safety equipment including fire extinguishers and safety blankets. We carry performer liability insurance up to $2M. Our fire performance has been reviewed and approved by the fire departments of many cities. The Fire Weavers hold a 100% safety record. In many years of professional performances, and hundreds of shows, we have never had an accident.